Each year between March 15-19, Las Fallas Festival lights up the historic streets of Valencia Spain with fireworks, processions and events. When it comes to the Mediterranean, most people think of panoramic vistas of coastline and blue water. Street parties don’t usually come to mind. But during las Fallas, Valencia, Spain’s third-largest city, offers both. 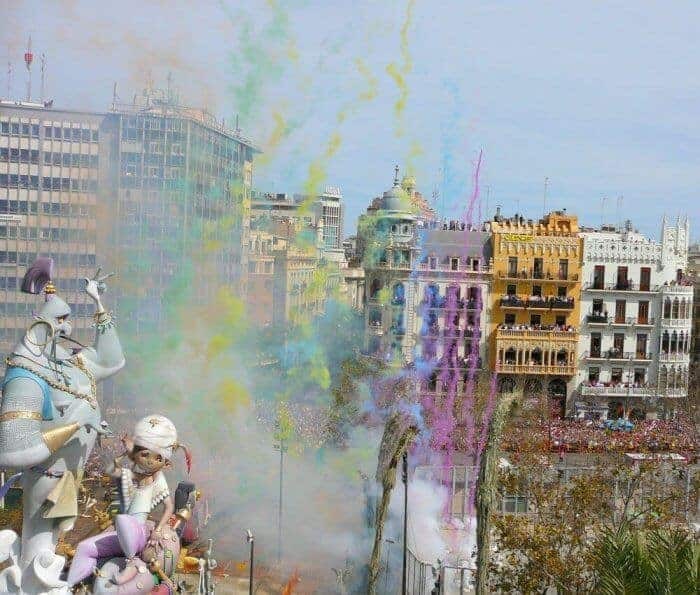 In addition to its lovely Mediterranean scenery – such as long, wide beaches and fragrant orange groves – it’s the home and birthplace of Las Fallas Festival, one of the world’s most important pyrotechnic events. Much like other major festivals and celebrations in the world, Las Fallas fireworks display is an exuberant celebration of culture and national pride. What began centuries ago as a feast day for St. Joseph, the patron saint of carpenters, has evolved into a 5-day celebration of fire. Between March 15th and 19th each year, Valencia transforms from a quiet city with a population of 800,000 to over two million flame-loving revellers. From the simply curious to the confirmed fanatic, they all come out to experience the thrills of this pyrotechnic spectacle. The festival begins in the early morning of March 15th with la planta, the installation and unveiling of the falla monuments in the streets and squares of central Valencia. 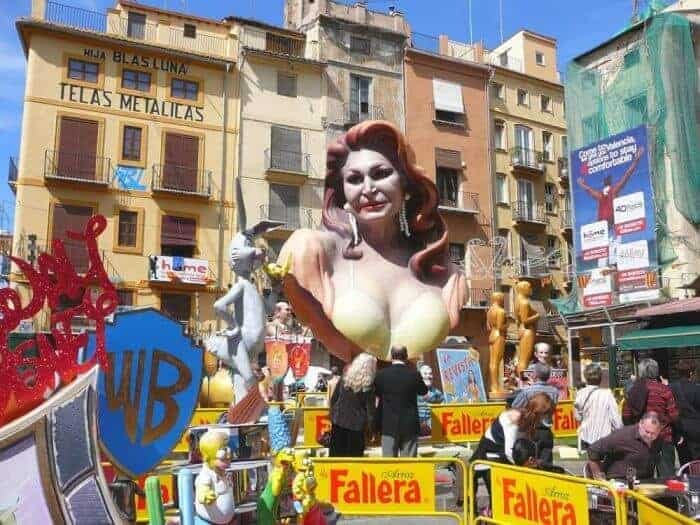 Over 400 comisiones falleras or neighbourhood falla groups sponsor their own gigantic sculpture. In the 18th century, the sculptures were primitive constructions created out of old furniture, rags and wax. Now, they are works of art crafted by teams of local artisans who can take up to six months to complete their creation. Made of papier-mâché or polyurethane and stretching several stories tall, the sculptures represent everything from Mad Max futuristic characters to cartoon effigies of celebrities. Satirical scenes from politics to current affairs are also popular. There are even fallas for children. 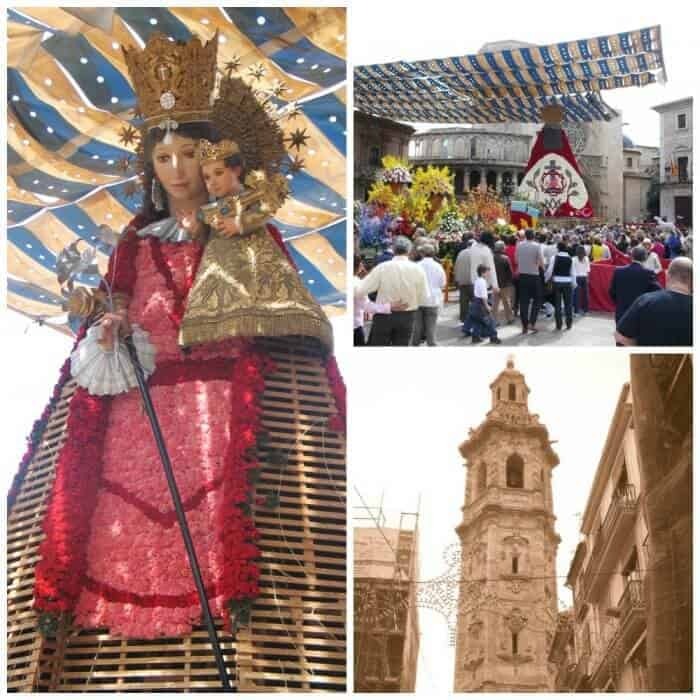 During the festival, each day begins with la despertà or wake-up call at 8 a.m., when processions of brass bands and falla groups march through the streets dressed in traditional costumes, playing music and throwing large firecrackers. Everyone from little children to shopkeepers get into the act by tossing their own fireworks as they pass by. Valencians are proud of their heritage and the daily processions of falla groups proclaim a long history of tradition. Get into the festival spirit yourself by purchasing a panuelo, a blue plaid bandanna to wear around your neck, and begin exploring the falla installations of the historic downtown. Valencia’s dramatic architecture is worth noting during your stroll. Originally founded in 138 BC by the Romans, the city has a long history as an important trading centre. Many buildings, such as the Cathedral of Valencia, constructed in 1262, reflect a mixture of Romanesque, Gothic, Baroque and Renaissance styles. 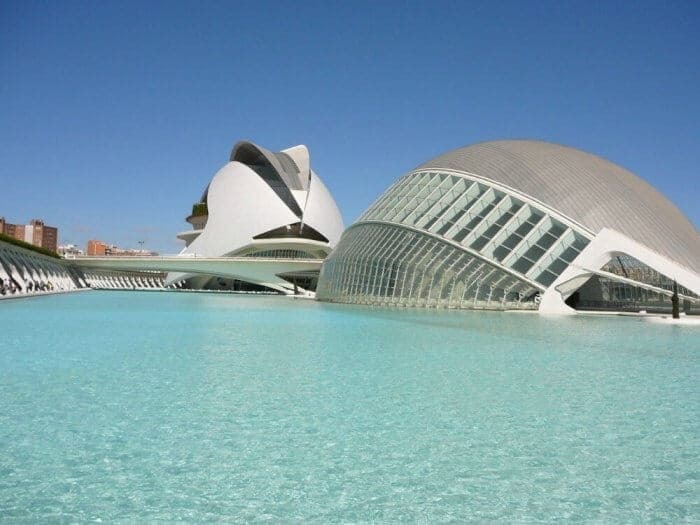 The City of Arts and Science is a stunning modern building and exploring its fascinating exhibits is one of the top things to do in Valencia. The UNESCO World Heritage site, Lonja de la Seda, built between 1482 and 1533, is an exceptional example of late Gothic architecture. Surrounding the old city centre are the remains of the ancient walled city. The Torres de Serranos, a restored 14th century city gate located at Serranos Bridge, is an excellent vantage point for watching the festival’s evening fireworks displays. 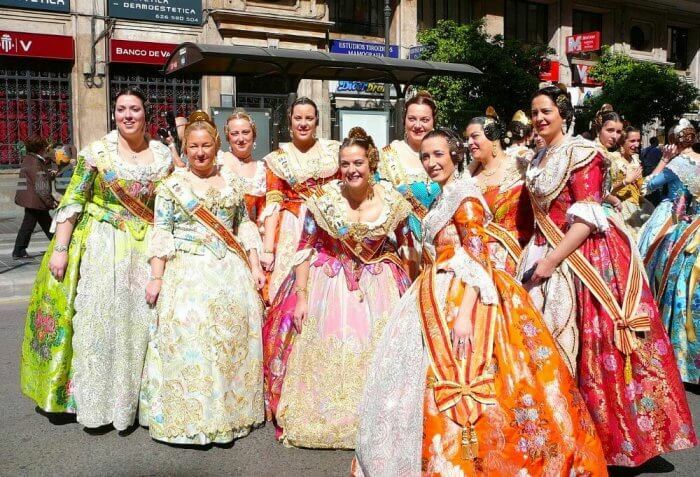 Anyone planning to sleep in late is sure to be awakened by the mascleta, a thunderous midday concert held at 2 p.m. in the Town Hall Square each day from March 1st to 19th. This celebration begins with a low rumble, becomes a ground-shaking roar and finally explodes into a cacophony of sound that echoes off buildings and mingles with the shouts from the watching crowds. Finally, plumes of fireworks in magenta pink, green and brilliant yellow cascade through the skies. As evening approaches, the pace of activity begins to build. From wide-eyed babes in strollers to hipsters gyrating to live music, the historic downtown streets are packed with people. Strings of tiny coloured lights hang from the glossy leaves of the orange trees and the air is filled with the smoke from firecrackers. Other diversions include beer gardens, bonfires and dancing. With 700 streets blocked to traffic, there is plenty of all-night partying to be had. A highlight of the activities is the nightly fireworks display at 1 a.m. Held in the old Turia riverbed, it is a colourful, creative explosion of light and sound visible throughout the old town. Each night, the displays become increasingly grander, until the night of March 18th, when the most spectacular show of all occurs. Known as the La Nit del Foc or Night of Fire, it is a symbolic preview of the final celebratory burning of the fallas the next evening. If you really like to party, check out this post on the top music festivals in Spain. Between spectacles, it’s time to chill out and sample some Valencian food. The region is best-known as the birthplace of Spanish paella. This traditional dish is a not-to-be-missed experience. The most authentic version features saffron-scented rice topped with tender pieces of rabbit, chicken and snails served up in a jumbo-sized casserole which often requires several men to carry it. A terrace alongside historic Plaza de la Reina is an ideal place to sample paella and soak up the midday Valencian atmosphere. For an authentic taste of traditional paella, try La Matandeta, located within the rice fields just outside town. 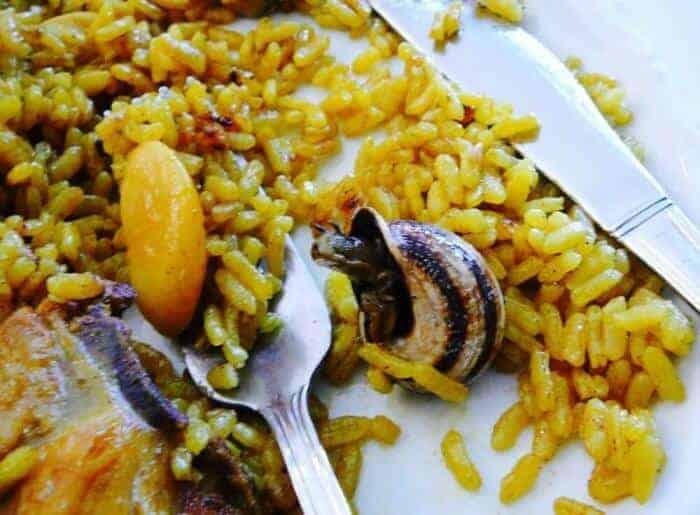 Here, you’ll expect to find paella with rabbit, chicken, duck and even snails served in jumbo paella pans and enjoyed by local families on Sunday afternoons. Another popular food during Las Fallas Festival is tapas. A top choice for Las Fallas food is Las Cuevas restaurant on Carrier del Comte D’Almovar while a table on the second floor of Sagardi restaurant on Calle San Vicente Martir is a good choice for its birds-eye view of the festivities. Tip: Make your own Spanish tapas with our easy recipe for Cream of Sardines with Smoked Salmon and Capers, a delicious tapas created by celebrated Basque chef Martin Berasategui, who holds eight Michelin stars. Nightfall is the time to stroll Barrio del Carmen in the old quarter sampling local cocktails such as Agua de Valencia (orange juice, Spanish champagne, vodka and Cointreau) or a traditional drink such as horchata, made of tiger nuts. For something sweet, also be sure to stop at a street vendor and pick up a churro, a deep-fried donut sprinkled with sugar and served in a paper cone. The festival is not just about partying. 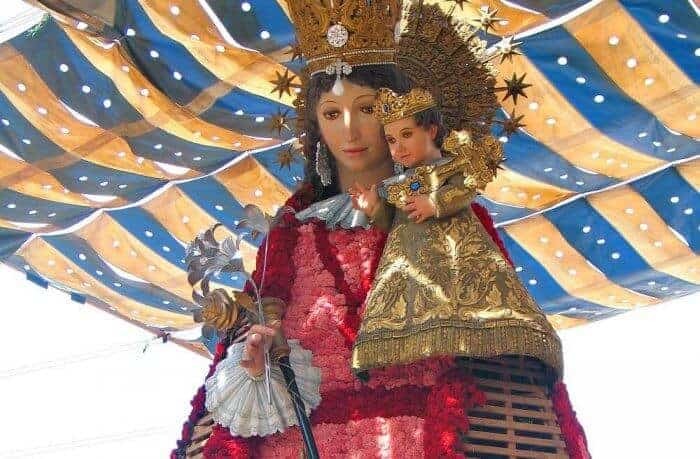 Demonstrations of religious devotion to Our Lady of the Forsaken, the patron Virgin of Valencia, also play an important role in the festivities. During La Ofrenda, a floral offering conducted on the 17th and 18th of March, thousands of falleras, local women in traditional regional dress, parade in their finery of velvet, lace, gold filigree jewellery and shawls through the cobblestone streets to place flowers on an enormous wooden structure in the Plaza de la Virgin. Fragrance fills the air as the flowers collectively form a colourful shawl. Another spectacular procession is La Cabalgata del Fuego, a celebration of the culture of fire on the evening of March 19th. During this pagan-inspired spectacle, hundreds of figures dance through the streets accompanied by costumed participants representing mythical beasts, dragons and fire-breathing monsters. The festival’s grand finale is known as la cremà, when the fallas monuments are set alight in huge bonfires and burned to the ground. The activities begin at 11 p.m. with the burning of the children’s fallas. As the countdown to midnight begins, the crowds begin to chant and the streetlights are turned off. At midnight, the torch is put to all the fallas. Only the first prize winner, selected for its originality, beauty and technical achievement, is spared and preserved within the city’s Falla Museum. Following the torching, the clouds of smoke, deafening fireworks and colourful bursts of aerial pyrotechnics overhead make for a fantastical open-air nightclub. 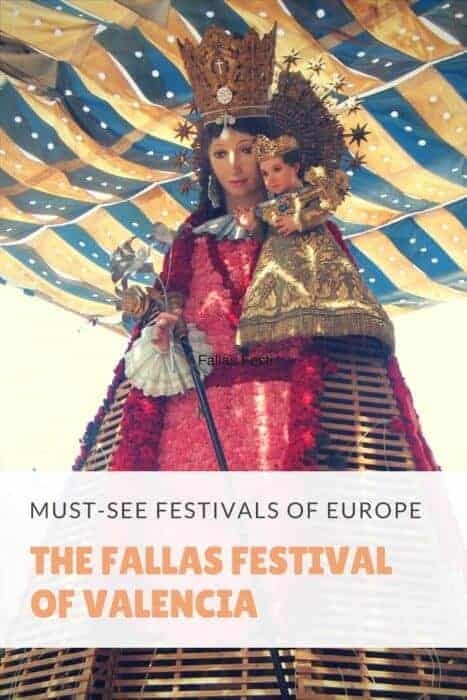 No matter whether your interests lie with the festival’s tasty culinary treats, the uniqueness of its cultural traditions or the non-stop partying, las Fallas Festival of Valencia offers a quintessentially authentic Spanish experience. Just don’t forget your earplugs. Valencia is located 350 kilometres southeast of Madrid and 350 kilometres south of Barcelona on the Mediterranean coast. It can be reached by rail, bus and air. Seville: While in Spain, it’s definitely worth visiting beautiful Sevilla. Nautal Boat Rental: For an incredible experience, discover the coast of Spain while sailing with Nautal Boat Rental. Nautal is an intermediate charter agency based in Europe with 19,000 boats in 22 countries. So whether you want to rent a sailboat in Barcelona, a yacht in Ibiza or a schooner in Turkey, you’ll be sure to find the perfect boat for your European vacation. Browse for a deal on a hotel by using the handy HotelsCombined website, a search engine that compares major hotel booking websites such as Expedia and Booking.com to find the lowest rate. And that’s not the end of things to do in Europe! This festival in Valencia looks like a blast – especially with the fireworks :-). Just read about Fallas for the first time the other day! Looks so fun! Thanks for sharing! Valencia has always been on my radar. Although I’ve been to Spain twice, never to Valencia and now that I know more about this it would be a perfect time to go—the festival and getting away from Canadian winters! When I read blogs, I love discovering new things. I had no idea that Valencia was the birthplace of paella. One would believe, no doubt that it’s fabulous there. I actually think the next time I go to Spain, I will put Valencia on my list. Glad you wrote about it! The Valencia festival looks like a lot of lively and colourful fun. It would be great to be there for it, but it sounds as if Valencia is worth a visit at any time. We’ve adored the city’s we have visited in Spain, but sadly, Valencia hasn’t been on our list. Thanks for the photos and tour, it brought the city to life for us! What a fabulous time to be in Valencia. Some of the fallas are very impressive. I love the architecture and together with the food, it looks like a great place to visit. Those sculptures are amazing. What a lot of work goes into them — just to be set ablaze! 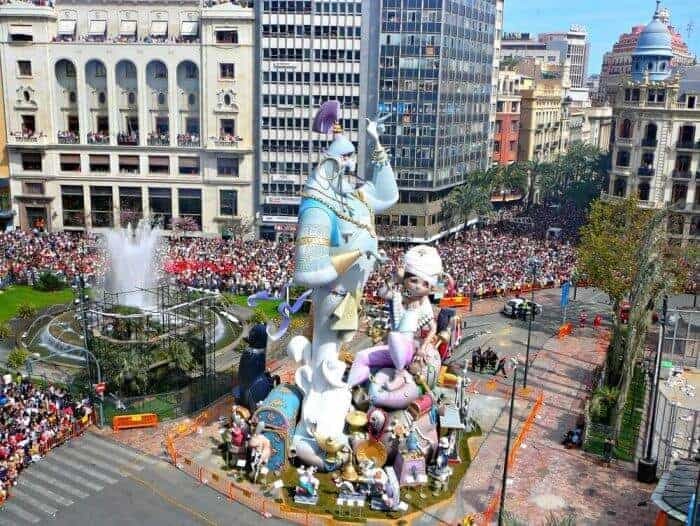 Looks like Las Fallas Festival time would be a great time to visit Valencia. I’ve never been, but it seems to have a wonderful mix of things that I love — food, architecture, festivals and fun. WOW! Las Fallas Festival looks like so much fun. When you say giant sculptures you’re not kidding. It must have been difficult to take everything in with so much going on. 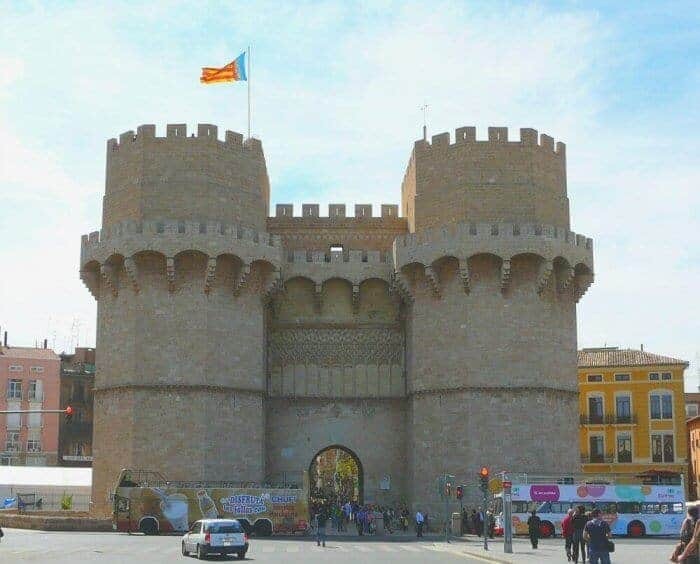 I love Spain but haven’t been to Valencia – yet – you definitely put it on my radar. Thanks! Love everything about how you have described this festival. I’ve been dying to get back to Spain since I explored Costa Brava. The mix of food architecture would be something I love, and if I could ever get to Valencia during this colorful festival,that would be the icing on the cake!